During our previous “Wines of Altitude” post we featured Salta's Amalaya Wines. And the parent to that brand and the founding Salta, Argentina member of the Hess Family Estates is Bodega Colomé, the founding member of the Hess Family Estates in Salta - established in 1831. The winery and Colomé Vineyard are located at 7,545 feet above sea level and operates three other vineyards ranging from 5,750 (La Brava Estate) to 10,200 (Altura Máxima Estate) feet above sea level. This last could be the highest vineyard in the world. This altitude provides intense sun exposure as well as a wide range in thermal amplitude, ranging between 20° during day and night. Those factors facilitate the uniform and balanced development of the grapes. According to the winery, "La Brava Vineyard sits at 5,740 feet and yields intense and ripe fruit. Colomé Vineyard surrounds the winery at 7,545 feet and lends complexity and weight. El Arenal Vineyard at 8,530 feet gives elegance and freshness to the blend and Altura Maxima at 10,207 feet gives floral and mineral notes with fine grain tannins". I recently received two samples from the winery, one a Malbec, the region's popular red signature grape and a Torrontés, the region's white signature grape. DNA research has shown that Torrontés is a cross between the Mission grapes of Galicia, Spain and Muscat of Alexandria. And the Muscat lends plenty of aromatic qualities. 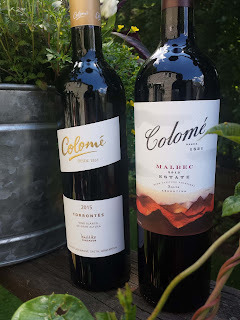 2013 Colomé Estate Malbec ($25) is 100% Malbec made from grapes grown at all four vineyards. After fermentation the wine is aged 15 months in French oak barriques and then an additional six months in the bottle before release. The result is a very nice wine: medium bodied, fresh red and black fruit followed by spices and noticeable tannins and acidity. 2015 Colomé Torrontés ($15) is 100% Torrontés harvested from 30 - 60 year old vines. The grapes are fermented slowly at low temperatures in stainless steel and then aged three months in steel before bottling. This is a nice wine, abundant floral aromas, plenty of stone fruits, grapefruit, and refreshing acidity.